The archetypal Ig-superfold in immunoglobulins mediates specific recognition through the complementarity-determining region (CDR) loops at one end of the variable domain P-sandwich. However, subsequent IgSF structures and functional studies have highlighted the diversity of potentially functional surfaces on the Ig-superfold. Ig-like domains can interact with a ligand via their P-sheets, via their loop regions, or via a combination of both. A single Ig-like domain may be functional in isolation or two or more may be required, either as consecutive domains of the "beads on a string" molecular architecture or as homo- or het-erodimers. Finally, the combination of protein-protein contacts mediated by a single IgSF molecule can result in the formation of extended interaction arrays at and between cell surfaces. Figure 2 The MHC class I-CD8aa complex (PDB code 1AKJ ). 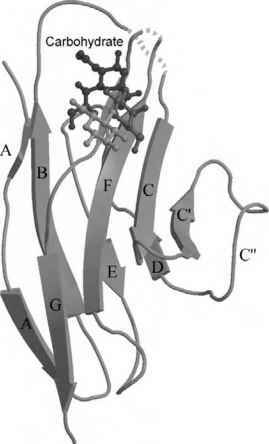 immunoglobulins when binding to antigenic surfaces containing a single prominent loop. Monomeric IgSF cell-surface molecules mediate interactions with a broad spectrum of ligand types, many discussed in detail elsewhere in this handbook. The diversity of lig-ands is matched by the diversity of interaction modes. For completeness, three of the most distinctive interaction mechanisms are briefly reviewed here. At present, there is no complex structure to illustrate definitively the mode of interaction of IgSF members such as ICAM1 and ICAM2, VCAM, and MadCAM with integrins; however, the key contribution of an aspartic acid residue that is prominently exposed on a loop in the N-terminal Ig-like domain of these molecules is well established [15-20]. It is believed that this acidic residue may contribute to the coordination of a divalent cation within the integrin structure . Several Ig-superfold-mediated protein-protein interactions involve contributions from the linker region between two sequential Ig-like domains within a receptor structure. This mode provides a common theme for the otherwise diverse interactions of the FGF receptor to the cytokine FGF [22-24] and the KIR family of natural killer (NK) cell receptors to MHC class I molecules [25,26]. Both families of interaction have been characterized by crystal structures of representative complexes and are discussed in detail in subsequent chapters. In addition to mediating protein-protein interactions, the Ig-superfold can adapt to function in glycan recognition. This property is exemplified by cell-surface receptors of the siglec (sialic acid binding IgSF lectin) family . Members of this IgSF subgroup are characterized by the sialic acid binding function of their N-terminal, V-set, Ig-like domain. The key features of the siglec-style binding site for sialic acid have been revealed by the crystal structure of the N-terminal domain of sialoadhesin (siglec-1) in complex with 3' sialyl-lactose . The binding is centered on the N-terminal portion of P-strand G at the edge of the P-sandwich (Fig. 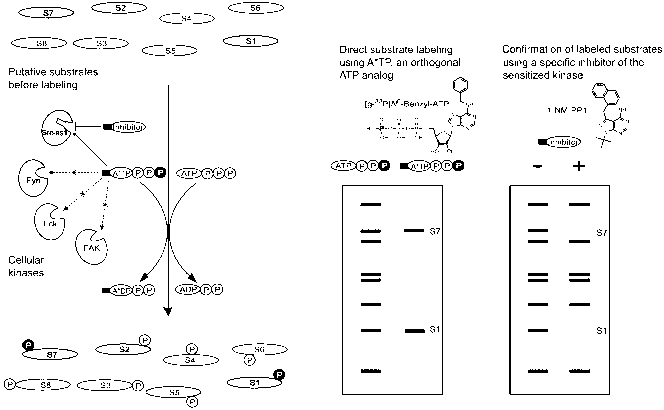 3) and utilizes interactions with side chains from three residues (an arginine and two tryptophans) that are conserved across the siglec family. Figure 3 The N-terminal Ig-like domain of sialodhesin in complex with the carbohydrate 3' sialyllactose (PDB code 1QFO ). include P0-P0 (where molecular contacts within the crystal lattice are representative of homophilic IgSF-IgSF interactions ) and the structures of CD2-CD58 and B7-1-CTLA4 (representative of heterophilic IgSF-IgSF interactions [30,31]). The homophilic interactions of the neural cell adhesion molecules show some variations on the above theme. A crystal structure of the first two N-terminal Ig-like domains of NCAM revealed a propensity for this molecular fragment to interact as a cross-shaped antiparallel dimer with residues from the B and E P-strands of domain 1 in molecule 1 interacting with those of the FG loop in domain 2 of the second molecule . Functional data suggest that interactions mediated by domains 1 and 2 may not represent the whole story, but this dimer structure does provide a compelling mechanism for one mode of NCAM-mediated cell-cell adhesion. The four N-terminal Ig-like domains of chicken axonin-1 , and the distantly related insect protein hemo-lin , form a U-shaped structure due to intramolecular contacts between domains 1 and 4 and domains 2 and 3 that acts as the functional interactive unit. Lattice contacts within the axonin-1 crystals suggest that these U-shaped units mediate cell-cell interaction via an edge-to-face type of packing involving the CE loop in domain 3 and the FG loop in domain 2.
cis Interactions Modulating Avidity In general, cell adhesion molecule interactions are individually low affinity interactions. However, several crystal structures have provided significant evidence for the occurrence of homophilic cis interactions between IgSF molecules, interactions that could mediate the formation of stable, zipper-like arrays in the context of a cell-cell interface. The crystal structure of P0, the major structural protein of peripheral nerve myelin, provided one of the first such examples, with crystal lattice contacts suggesting that cis interactions mediate formation of P0 tetramers that in turn mediate an array of trans interactions to clusters of tetramers on the opposed membrane . Array-wise interactions have also been proposed for the neural cell adhesion molecules exemplified by axonin-1 . 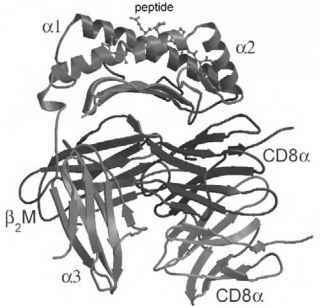 Heterophilic examples include the dimeriza-tion of B7-1 , which, when combined with the dimeric molecular structure of its IgSF ligand CTLA-4, could result in the formation of extended arrays between T cells and antigen-presenting cells in the immune system [31,33,34] (Fig. 4).